One turn in the mirror and you might notice that excess fat has set up shop in your mid-back. This can result in unsightly rolls, or what some women call "bra bulges." 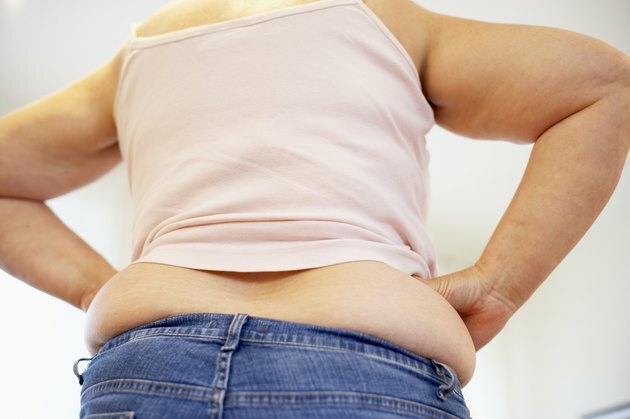 Spot-reducing this fat isn't possible; to reduce fat anywhere in your body, you must lose it from all over. A healthy eating plan that's paired with an effective exercise routine can help you do this. When your body fat reduces, those dreaded back rolls will also melt away. 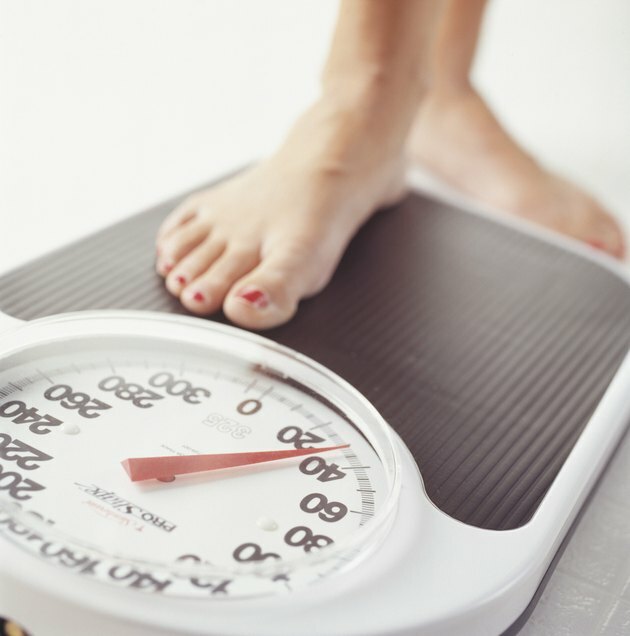 Reduce your weight at a maintainable, gradual rate of 1/2 to 2 pounds per week. According to the Weight-Control Information Network, this helps prevents nutritional deficiencies and gallstones that are associated with fast weight loss. Focus on creating a daily deficit of 250 to 1,000 calories through diet and exercise to achieve this. Modify your diet to reduce the amount of calories you consume. Eat smaller portions and limit weight-loss-sabotaging foods that are high in salt, cholesterol, sugar and trans and saturated fats. Compare food labels so you can make sensible choices. Get your nutrients from low-fat protein, such as lean cuts of meat, beans and nuts, a variety of veggies and fruits, reduced-fat dairy products and whole grains. Increase the amount of cardiovascular exercise you do so you burn more calories that help melt body fat including your back fat. The National Heart, Lung, and Blood Institute recommends doing up to one hour of moderate-to-vigorous cardio almost daily to lose weight. Perform cardio that engages your back. For instance, pump your arms back and forth while you jog or walk briskly, use an elliptical machine with moving handles, exercise on a rowing machine or take a boxing class. Incorporate about 30 minutes of resistance training into your schedule on two or three days of the week. According to the University of Rochester Medical Center, this aids in weight loss, because it preserves muscle tissue, which boosts your metabolism by using up more calories than fat to sustain itself. In addition to your back, target all major muscle groups including your abs, hips, shoulders, arms, legs and chest. Include effective back-strengthening exercises in your resistance-training routine. This helps strengthen and tone the muscles underneath the fat so that when the fat melts, you'll have a well-defined back to show off. Perform exercises, such as lat pull-downs, pull-ups with or without an assisted pull-up machine, bent-over dumbbell rows, and dumbbell pullovers while lying on a bench. 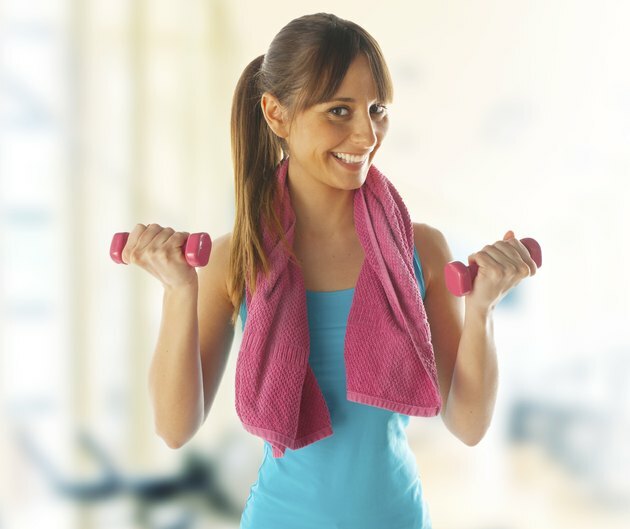 If you're new to exercising, consult as certified trainer who can familiarize you with different exercises and machines, and teach you proper exercise form. See a physician before attempting a new weight-loss regimen if you've been inactive or suffer from a medical condition or injury.